As the Mars Exploration Rovers Spirit and Opportunity start to wind down their immensely successful 8+ year mission, NASA's newest and most capable robotic planetary mission the Mars Science Laboratory (MSL) rover, dubbed 'Curiosity', has safely landed on the surface of the Red Planet. Packed with ten science instruments to explore geology and detect the building blocks of life, Curiosity is a six-wheeled radioisotope-powered vehicle about the size of a car. On the way down, its Mars Descent Imager (MARDI) impressively captured the rover's descending the surface in this time lapse video and high-resolution image. Even more remarkable was the fact that the HiRISE camera in orbit snapped a photograph of the rover and its parachute during their descent and later found the discarded heat shield, parachute, and sky crane in their final resting places on the martian surface. The sky crane, by the way, was the most unusual and risky part of this mission. No object has ever landed on another planet this way. NASA's ingenuity in pulling it off is no less remarkable than landing on the Moon or saving the Apollo 13 astronauts. 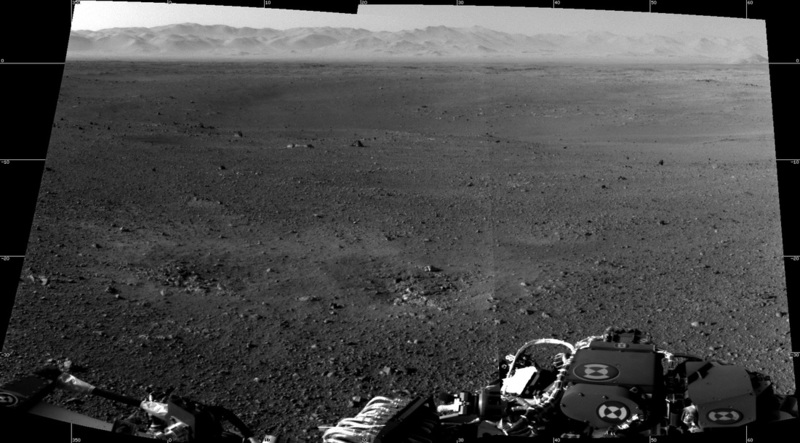 Below is the first panorama of the surrounding landscape taken by the MSL navcams. #MSL was one of the highest trending topics on Twitter, grabbing the attention of even President Obama here and here. Google even featured the rover being lowered by its sky crane in the August 6 Google Doodle. NASA is clearly a master of public relations and marketing. They provide a beacon of inspiration amidst a sea of division and discontent that is all too common in our society today. PC World posted a complete list of ways to follow the mission, including Curiosity's own first-person Twitter account @MarsCuriosity. "This is a great day for space exploration. Not only is this the beginning of the most powerful Mars exploration mission ever flown, it is a demonstration of a landing system that can deliver a ton to the Martian surface, thereby enabling all kinds of great future missions, including sample return. More than that, it is a demonstration of excellence that not only justifies the pursuit of the robotic exploration program, but shows that we have the skills needed to succeed were we to rise to the challenge of sending humans to Mars. Give our space program the stuff it needs, and there is no limit to what we can do!" Dr. Zubrin is featured along with NASA scientist Margarita "Mars" Marinova (whom I met recently during RESOLVE operations in Hawaii) in an upcoming documentary titled "Someday Somewhere Beyond." It gives a clear picture how humanity is destined to one day occupy and perhaps terraform Mars, helping us to in turn solve important problems here on Earth. Colonizing Mars from DEEPSPEED media on Vimeo. To hear more from Robert Zubrin, check out his new Moonandback interview, which is freshly online today. In it, he discusses how we don't necessarily need advanced technologies to get to Mars and could have been there years ago. In any case, the Curiosity rover is an important stepping stone that will play a vital role in helping us better understand the Mars environment and our place in the solar system. Update: Parts 2, 3, and 4 of Zubrin's interview are now online.